a paired dural venous sinus on either side of the sella turcica, the two being connected by anastomoses, the anterior intercavernous sinus (sinus intercavernosus anterior [TA]) and posterior intercavernous sinus [TA] (sinus intercavernosus posterior [TA]), in front of and behind the hypophysis, respectively, thus making the circular sinus; the cavernous sinus is unique among dural venous sinuses in being trabeculated; coursing within the sinus are the internal carotid artery and the abducent nerve. The cavernous sinus is sometimes described as a plexus because of its unique internal structure. one of a pair of irregularly shaped bilateral venous channels between the sphenoid bone of the skull and the dura mater. It is one of the five anterior inferior venous sinuses that drain the blood from the dura mater into the internal jugular vein. A paired dural venous sinus on either side of the sella turcica, the two being connected by anastomoses, the anterior and posterior intercavernous sinus, in front of and behind the hypophysis, respectively, making thus the circular sinus; the cavernous sinus is unique among dural venous sinuses in being trabeculated; coursing within the sinus are the internal carotid artery and the abducent nerve. 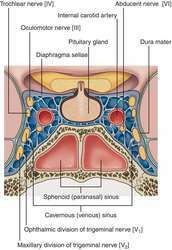 Synonym(s): sinus cavernosus [TA] . The large vein channel, lying immediately behind each eye socket (orbit) and on each side of the PITUITARY GLAND. Through it run a loop of the internal carotid artery, the nerve supplying the central part of the face with sensation, and several nerves supplying the muscles that move the eye. 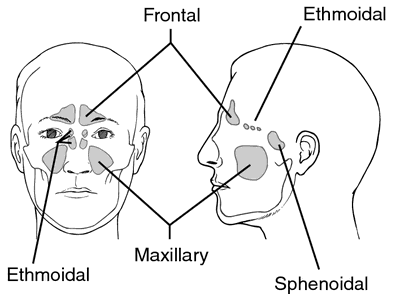 The sinuses receive veins from the face and orbits and communicate with each other and with other large veins surrounding the brain. A paired dural venous sinus on either side of the sella turcica. It is sometimes described as a plexus because of its unique internal structure. n an infection of the cavernous venous sinus. Increased risk with local anesthesia in the maxillary arch if infection is present (“needle track” infection). pertaining to a hollow, or containing hollow spaces. Follow-up contrast enhanced MRI of the brain was performed and showed significant regression of the post-contrast signal intensity in the right cavernous sinus, previously extending basally towards the trigeminal cave and anteriorly towards the apex of the right orbit, with right-sided temporal-basal dural sheath imbibition and imbibitions along the clivus (Fig. Case number 2 had used antibiotherapy with a diagnosis of cavernous sinus infection and was assessed again a month later with a diagnosis of painful ophthalmoplegia. Cavernous sinus thrombophlebitis (Sans thrombosis) secondary to odontogenic fascial space infection: an uncommon complication with unusual presentation. THS is caused by a non-specific inflammatory process in the cavernous sinus or superior orbital fissure (SOF). Ophthalmoparesis ensues when granulomatous inflammation in the cavernous sinus extends to oculomotor, trochlear, and abducens cranial nerves, whereas paresthesia of the forehead occurs with involvement of the superior division of the trigeminal nerve. An MRI scan revealed a one-inch wide tumour in part of the brain called the cavernous sinus. It should be considered for extension of thrombus to the cavernous sinus and continuing septic emboli despite antibiotics. To treat these complex lesions the deep knowledge of the cavernous sinus (CS) anatomy is paramount. The intracavernous part of CN III enters the cavernous sinus by piercing the dura lateral to the posterior clinoid process (Fig. CT study of head reveals an enhancement in right cavernous sinus as well as right convexity. Repeat MRI revealed enlargement of the sellar mass with extension into the cavernous sinus bilaterally and significant chiasmal compression.